U.S. intelligence agencies are closely monitoring the mole hunt first disclosed July 20 in news reports in Russia. One suspect in the case is Viktor Kudryavtsev, a 74-year-old researcher at a Russian rocket and spacecraft design plant who was arrested July 19 by FSB agents. A second person was reported arrested for treason as part of the investigation, Russian state-run news outlets reported Monday. Kudryavtsev was charged with "transferring classified information on the technologies used in the development of hypersonic aircraft to one of the NATO countries," a Russian government source told the pro-government news outlet Kommersant, quoting a security source. The source told the newspaper that as a result of the probe, "many heads will fly, and dismissals will certainly not be the end of the story." Another Russian news report stated that the loss of hypersonic missile secrets in the spy case explains why the U.S. government has expressed skepticism about the Russian hypersonic missile program touted by Russian President Vladimir Putin in a speech last March. Michael Griffin, undersecretary of defense for research and engineering, told defense reporters earlier this month that Russia's strategic hypersonic gliders will augment its large and modernized ICBM force. A major concern is the use of hypersonic maneuvering weapons for theater and regional conflict, including against ships, Griffin said. "Very quick response, high speed, highly maneuverability, difficult to find and track and kill," he said. Griffin said Russian and Chinese hypersonic missile programs are spurring U.S. development of hypersonic weapons that is now a high priority for the Pentagon. "We didn't see a need for it, but our adversaries get a vote, and they voted," he said, according to Defense News. "So we're going to see their hand and raise them one, in both offensive and defensive capabilities." Air Force Gen. John Hyten, commander of the Strategic Command, testified to the Senate in March that both Russia and China are making progress in developing ultra-high speed missiles for which the United States has no defenses. Hypersonic weapons are launched atop ballistic missiles and travel at speeds of Mach 5 or greater, or more than 3,836 miles per hour. They are capable of maneuvering on the edge of the atmosphere where they can strike targets globally in minutes. The spy investigation began July 20 when FSB agents raided the offices of the Central Scientific Research Institute for Machine Building, known by its acronym TSNIIMash, and within the offices of the director of the Unified Rocket-Space Corporation known as ORKK. The searches took place at TSNIIMash in Korolev, an industrial zone northeast of Moscow that is known as a center for space research. TSNIIMash is part of the state space agency known as Roscosmos. The ORKK plant is located in Moscow. A spokesman for Roscosmos, Vladimir Ustimenko, said July 22 that Kudryavtsev was arrested but he provided no additional details. "Investigative actions are now being conducted with him," Ustimenko said, adding that other employees at Roscosmos are under investigation. The space agency also said in a statement that the Roscosmos Director General Dmitry Rogozin had directed all employees to cooperate with the FSB probe. As many as 10 people are said to be the target of the investigation, Kommersant reported. Another focus of the probe is Dmitriy Payson, director of research and analysis at ORKK, who may have been the origin of top-secret information supplied by the spies to western intelligence. The hypersonic missile program is being carried out through a Russian firm called Tactical Missile Armaments that is not part of TSNIIIMash but works closely with the rocket company. Kudryavtsev last year signed an open letter to Russian President Vladimir Putin that defended a Russian researcher, Vladimir Lapygin, who was sentenced to seven years in prison last year for treason. The investigation and arrest were reported by state-run TASS and Interfax, in addition to Kommersant. On July 19, a day before the first arrest, Russia's Defense Ministry disclosed that the Avangard warhead was ready for series production, the Moscow MK Online news outlet reported. The MK report said the Defense Ministry provided an update on the Avangard that was described as a "gliding winged warhead" that travels at hypersonic speeds. "The complex's development has been completed," the report said. "Industry enterprises have begun its series production. The gliding winged warhead flies at an altitude of several dozen kilometers in the atmosphere's dense layers." The Avangard "possesses combat capabilities, which permit it to carry out the guaranteed penetration of any missile defense systems," Maj. Gen. Sergey Poroskun, deputy commander of Russian strategic rocket forces, was quoted as saying. "The Avangard missile complex's gliding warhead is capable of flying with hypersonic speed and of conducting controlled maneuvering, both lateral and also based upon altitude, which ensures its invulnerability," he stated. Mark Schneider, a former Pentagon nuclear specialist, said Russia has placed a lot of emphasis on developing hypersonic arms. "In the aftermath of the Helsinki summit, Russian state media went into nuclear threat mode with a lot of emphasis on the hypersonic missiles that are part of Putin’s nuclear super weapons revealed in his March 2018 State of the Nation address to the Duma," Schneider said. Between July 18 and 21, the main official news agency TASS published seven stories on superweapons. "Contrary to what the American left is attempting to peddle, these are all real new weapons systems," Schneider said. "The hypersonic missiles in particular are very serious threats and we will not have any nuclear capable counterparts under the current U.S. programs." The Pentagon is developing its own hypersonic missiles, including a system called the Advanced Hypersonic Weapon that is part of the Conventional Prompt Strike program. The FSB investigation followed a CNBC report in May that said U.S. intelligence agencies had reported Russia's test of the Avangard hypersonic glide vehicle that could be deployed by 2020. Quoting sources with direct knowledge of intelligence reports, CNBC stated that the hypersonic vehicle will carry a nuclear payload but could also be used with non-explosive kinetic capabilities. The Avangard hypersonic glide vehicle is expected to enter Russia's arsenal by 2020. The Avangard was tested twice in 2016, the report said, and once in October 2017 when the glider crashed seconds before reaching its target. The report said the glide vehicle is fired atop an SS-19 intercontinental ballistic missile. A fourth test of the Avangard is expected this summer. The glide vehicle is said to be capable of defeating the most advanced missile defenses and is highly maneuverable. In March, Putin revealed several new Russian military systems during a speech and video presentation that included two types of hypersonic missiles. The first is an air launched hypersonic weapon called Kinzhal, or Dagger, capable of reaching speeds of Mach 10, or 7,672 miles per hour, with a range of up to 1,240 miles. The missile is said to be capable of being equipped with either a nuclear or conventional warhead and has been tested in southern Russia. The second hypersonic glided was identified by Putin as the Avangard, or Advance Guard, that he asserted could travel at speeds of up to Mach 20, or 15,345 miles per hour. 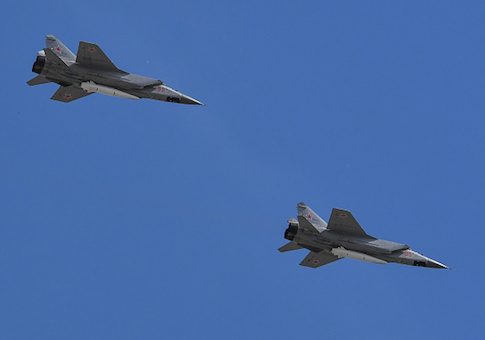 The MK report said another hypersonic missile, the Kinzhal, is on alert with MiG-31 aircraft patrolling over the Caspian Sea. "From here, the MiG-31K high-speed interceptors are capable of delivering a Kinzhal to targets in the Black and Mediterranean seas in a matter of minutes."